It was in round 5 not 4 that we hosted Richard Cockerill's Edinburgh at the RDS last season, and going into it we were expecting a comfortable win yet coming out of it we felt lucky to be escaping with four match points. We needed one of our trademark tries at the end of the first half (we got another one just last weekend) to inch us in front and despite a 51st minute yellow card for James Ritchie we didn't manage to pull away from our guests until the closing stages, when a converted try by Jamison Gibson-Park denied them the losing bonus point. There was, shall we say, something of a debate going on after the match surrounding the performance of referee Ian Davies. "...if you believe in an anti-Edinburgh refereeing conspiracy, some of the calls in this game might add fuel to your fire." "...if you choose to play with that level of physicality and that close to the edge of the Laws, that's fine but don't complain if the ref in turn chooses to look for it"
I won't insult your intelligence by telling you which side Embra coach Richard Cockerill was on! Never short of a word about perceived forces working against him is ol' Cockers, and as chance would have it, he was at it again after their win over Connacht just last weekend. Now to be fair, having seen the match I actually do think he had a case to make about Connacht having shipped a ton of penalties without further sanction (thus potentially denying him a bonus point) but the problem with playing that "we was wronged" card is that it only works so many times. He'll probably need more than that to overcome Leinster's second top heavy home lineup in as many weeks, though considering the lads from the Scottish capital went on from last year's defeat all the way to the playoffs, they have every right to demand more respect from previews this time around, yes? Well, not according to the bookies...they're still going for a winning margin of over twenty points; maybe that's because we went on to have a decent enough campaign ourselves. Johnny Sexton leads out the side again and this time it's for his 150th cap, and after JGP's man-of-the-match display last week, Luke McGrath returns to the starting lineup to remind us of what he can do. Once more outside the halfbacks is the dream 'Henrose' pair of centres...they did well against the Dragons although Garry could well be watching his missed tackle count on Saturday. Then we have this week's "ANZAC dilemma" seeing Scott Fardy sit out so that James Lowe can entertain the RDS crowd for the first time this season. Having Larmour and McFadden alongside him in the back three gives us plenty of try-finishing capability so the expectations will be high once again. 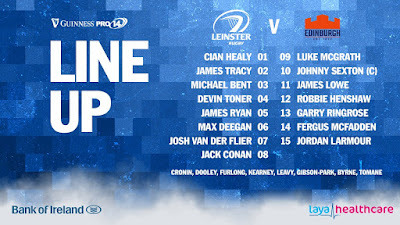 It promises to be another good week for the Leinster bench and after Josh van der Flier's return it will be great to see Dan Leavy back in action as well. Also we have a replacement front row many top clubs in Europe would happily start, that includes Peter Dooley who impresses for the boys in blue every time I see him. On the visitors' side, I expect very similar tactics to those they employed last year - though they would do well to take note from Ross Moriarty's efforts and try to sell their treachery a lot better. Last week I was challenging us to beat the big winning margin laid down by the bookies...this time I'll be happy if we stay on the other side of it. Four tries might be hard to come by although I'm expecting our defence to keep their side of the scoreboard down and if Embra bring the physicality Sexton could get to kick a few penalties so I'm going for a home win of around 12-15 points. Replacements: 16. Dave Cherry 17. Pierre Schoeman 18. Murray McCallum 19. Callum Hunter-Hill 20. Luke Crosbie 21. Nathan Fowles 22. Simon Hickey 23. James Johnstone.